Record Anything you see on your screen – Perfect of Video Games! No Freezing. No Slowdowns. 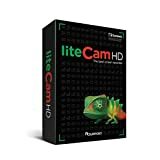 liteCam HD is an easy-to-use PC screen recording/capture software that helps create professional-looking HD videos in no time! Simply record anything on your PC screen in full HD and stereo sound. Gaming videos, tutorials, demonstrations, presentations, school projects and much more. Its simple and powerful interface allows you to make a recording within seconds of installation, without the stress of complex settings and special requirements. Convert your recorded videos to MP4 or WMV format with small file size and high resolution to upload to YouTube or watch on your mobile device (Android/iOS). Rsupport Screen Capture Codec (RSCC) offers the highest compression/quality and 30% faster speed when compared to TechSmith Screen Capture Codec (TSCC). Additionally, RSCC boosts encoding speed up to twice as fast as competitors. Plus, low CPU usage allows you to experience no lag or slowdown while recording. Highlight your video recordings with mouse effects or by drawing/typing on the screen in any color or size to draw viewers’ attention. With liteCam HD, you can add video titles, ending credits and your pictures! Custom editing features also allow cutting video timelines. Extract sound/audio or background music from your recorded video. After finishing the recording, you can schedule your computer turn itself off automatically. Visit www.litecam.com for more information. ACTIVATING liteCam HD 1. After purchase, check inside the box for the license key. 2. Run the DVD and installer will be launched. 3. Enter your name, email and the license key (all REQUIRED). Format: ABCD-1234-ABCD-1234 4. Continue with NEXT and finish the installation. 5. Enjoy!